Make an impression with every customer visit and increase your revenue per sale. Take a payment on the spot or make it easier for customers to pay you using an emailed invoice and electronic payment. 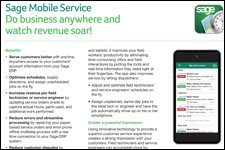 Learn how Sage solutions enable you to do business anytime, anywhere and gain the freedom to achieve your ambitions. These easy-to-adapt applications are available to all Sage 300cloud and Sage Enterprise Management users. 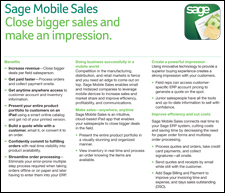 An intuitive mobile application, Sage Mobile Sales provides manufacturers, distributors and retailers with a mobile solution that improves the customer sales experience by giving sales reps all the information needed to make an impression and close bigger sales. This includes anytime, anywhere access to customer order history, product availability and an online product catalog. Improve cash-flow with mobile credit card acceptance and customer sign-off. Reduce costs and improve customer service with optimized scheduling. Help service employees optimize their work day. Increases employee productivity by giving them the information they need when and where they need it. Produce higher referrals and repeat purchases. Reduce customer disputes over service charges. Get paid faster and with fewer disputes by giving customer payment choices including credit card, on account, and so on. This application allows companies with field service technicians to be more efficient and flexible in the field. With this app on their mobile device, field service reps can schedule work, view completed orders, invoice and analyze from a web portal. Service employees can view detailed information such as customer service histories, work orders and approved estimates on their smartphones, leading to better customer service and higher employee productivity. Designed to provide Sage customers with an easy and cost-effective way to improve the invoicing cycle, Sage Billing and Payment is a new subscription-based service accessed through a web browser that streamlines and automates the accounts receivable process. The service accepts electronic payments, which reduces the time it takes to receive funds, and automates receipt delivery by sending electronic receipts instead of mailing paper ones. It provides customers with an online portal to manage their account and make payments instead of placing calls to customer service or sales. And, by utilizing electronic invoices instead of paper invoices, the app delivers invoices at a much lower cost. Improve customer satisfaction by offering the option of electronic invoices and payments. Decrease the cost of sending out invoices by over 90 percent versus paper invoices. Reduce the time and expense of filling and storing paper invoices. Reduce days sales outstanding by delivering invoices in two days (versus five to 10 days for paper) and receive payments faster than receiving paper checks.